Fundraising events are done two or three times a year and involves a set of activities for these events to be successful. You can participate on these activities in a number of ways, namely in the organization, publicity, promotion, tickets selling, venue setup, catering, entertaining, cleaning or simply buying. You make a donation by filling up a form and submiting it with a description of the type of donation you want to make, your contact details and the purpose for your donation, i.e. to a fundraising event, to the organization or to a particular objective. Don Bosco representatives will contact you for further details. There are two main types of sponsors, the one that sponsors a child (God Father/Mother) and the one that sponsors the organisation. For the child, a small monthly contribution of $20.00 dollars will suffice. For the organisation you would focus on providing financial help, products or services that would benefit these children. "Our vision is to help the rehabilitated youths re-assimilate into society to be good citizens and people of good moral values. To prepare these people to live independently, to become architects of their own destiny and to contribute to their society with these values"
Thank you very much for all your support during all these years, without you we would not be able to send these donations and help these kids in CDADB, Breña. We would also like to thank the Hon. 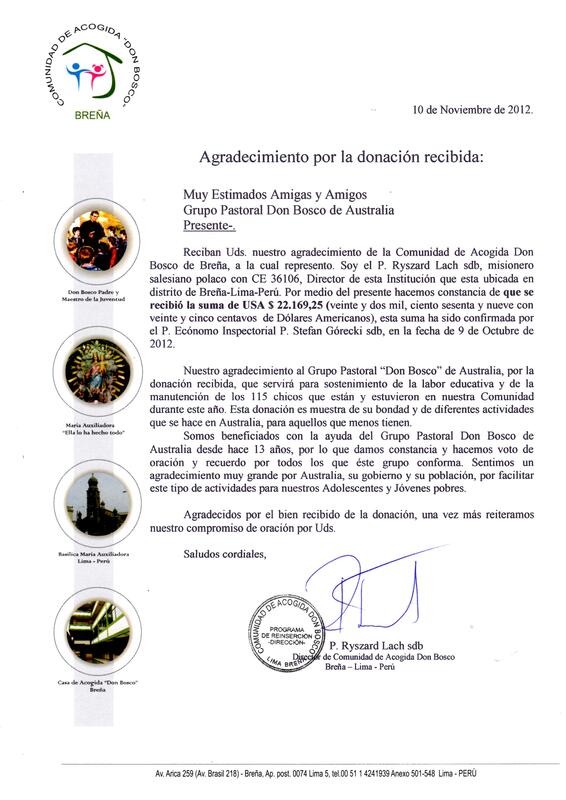 David Clarke for his motion and the great work he has done by agreeing and recognising "Grupo Pastoral Don Bosco" as a charitable organisation on his speech in Hansard - NSW Parliament, this is indeed a great achievement and marks a milestone in the history of the Peruvian community here in NSW and in Australia.